In limbo, Dracul and a mysterious female character discuss his defeat in the previous story. Dracul says that he got his power from Vulcan and the women then refers to him as "Abel". In Tokyo all the girls are stressed, studying for exams. They soon get sidetracked and begin to talk about a European flower that can be used to make eyes bigger. All the girls love this idea as they want bigger eyes like white people (actually something very common ammong Asian women) and some of them manage to find some at the new European store that recently opened up. They soon realise though that it was also a poison and start talking about studying again. Michiru begins to mention her tour to Europe and then a Swiss nun (who speaks English, go figure) who has become a teacher at their school enters and tells them all to study harder and be more respectful. She then leaves. Rei offers her temple as a place for everyone to study and they also invite the new student who ironically is also from Switzerland. On their way, several of them mention how lately the cats and dogs have begun disapearing around town. Usagi and Mamoru then share a romantic moment. In Transelvaniya several vampires gather and prepare for their plan to kill all the humans. They plot to steal the Imperium Silver Crystal that is held by Sailor Moon and plan to use these four young mysterious girls to assist them. The four girls introduce themselves as Para Para, Ves Ves, Jun Jun and Cere Cere. They begin to play and spot a flower blossoming on the hillside. They go to pick it but several superior vampires stop them and say while that rare flower will make any wish come true, it's voice will kill the person who picks it. They decide to anyway and are surprised when it picks itself and transforms into a human! He introduces himself as Mandrake and says that he hasn't grown enough yet to be able to grant wishes. In the Hikawa Shrine, everyone (except for Usagi) is studying. Minako then enters with Setsuna and Hotaru with some freshly cooked food and they all sit down to eat. Michiru begins to play her violin outside and they all listen. Suddenly everyone sees a silouette on the wall! Michiru races in and says that the vampires have returned! 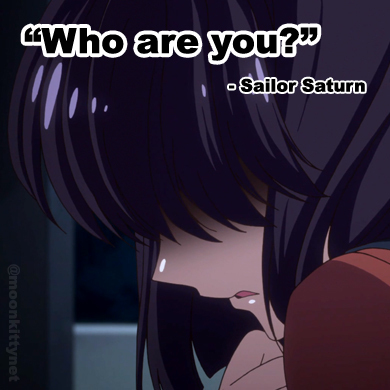 Rei transforms into Sailor Mars and defends her temple. The all put up a good fight but when Sailor Moon tries Moon Healing Escalation on the vampires and the leader, Lilith blocks it they know they're evenly matched. Fortunately the vampires realise that they can't do much with their powers in the temple surrounded by Rei's charms so they invite the Sailor Soldiers to a hidden location and retreat. In the dreamscape, Para Para, Ves Ves, Jun Jun and Cere Cere seem to be connecting with Chibi Usa. They all feel as if their soulds are calling out to each other but just as they begin to realise they can communicate the dreams end. Back at the vampire's base, Lilith, Vampiru and the others are told by Dark Vulcan that in Transilvaniya there will be a lunar eclipse and during this time the Imperium Silver Crystal's powers will be weakened. The Outer Sailor Soldiers arrive though to defend the planet and begin to battle the vampires. Sailor Jupiter also arrives and joins in the fight. Super Sailor Moon, Sailor Mercury, Sailor Mars and Sailor Venus also then arrive but Lilith then uses her powers to separate them all. Back in the world of dreams, Chibi Usa and Para Para, Ves Ves, Jun Jun and Cere Cere are once again communicating. Suddenly they're all brought into reality and the vampires arrive and tell the girls that Chibi Usa is holding a silver crystal of her own! Fortunately for Chibi Usa it also turns out that her Star Seed isn't ripe yet so if they remove it now the Quartet (Para Para, Ves Ves, Jun Jun and Cere Cere) will disapear). Tuxedo Mask arrives and tries to save Chibi Usa and suceeds! Vampiru who is alone elsewhere then sings of her father, who turns out to be Dracul and how she misses him. Lilith enters and says that they should target the strongest Sailor Soldiers first. The vampires locate Sailor Uranus, Sailor Mars and Sailor Jupiter and fight them before beating them and drinking their blood. Super Sailor Moon and the others arrive, but too late. A powerful vampire attacks them all with a powerful attack, Sammael Jihad which almost kills them all. Suddenly a mysterious woman appears and brings them all back from the brink with Solomon Birth! She introduces herself as Sailor Astarte and everyone recognises her as Siva, the Swedish exchange student! Sailor Astarte announces that she's come from the other side of the Sun and is the 10th Sailor Soldier. She then attacks the vampire with a powerful Solomon Jihad attack which breaks his sword. Count Dracul, in his own world sings of his loneliness and his mourning for his dead wife. After the battle, Sailor Astarte seems to revert to the previous evil Vulcan personality and talks with Lilith. She says that she should keep an eye on her as she doesn't know which side Sailor Astarte will take once she fully awakens. The vampire from before enters and demands to know why his sword broke. Astarte tells him that the sword choses it's master not the other way around. Meanwhile, Usagi, Mamoru and all the girls except for Minako who has gone to England arrive at the airport which is three hours drive from Transilvaniya. By "coincidence" they run into their nun / teacher who offers to find them accomodation. They follow her. In Castle Dracul, Vampiru mourns her mother and father and promises to revive them both with the power of the Imperium Silver Crystal. She seems to hate the vampires and tells them that once her parents are revived she will have nothing more to do with them. They all sense the girls arriving and split up. Upstairs the nun / teacher lets the girls in with the impression that the building is a hotel. Some of them mention that it looks like Castle Dracul but they shrug it off with the assumption that all Transilvaniyan castles look the same. Suddenly the lights go out and the vampires attack! They all try to transform but can't! The back wall opens, revealing four swords in glowing glass tubes and one powerful one in it's centre. Luckily Sailor Venus arrives and announces that she was aware the trip was a trap and had been following them the whole time. Sailor Venus fights them all long enough for the girls to get out of the evil field preventing them from transforming and become Sailor Soldiers. They all begin to fight when suddenly Count Dracul is revived! He rises from his coffin, draws the massive sword and teleports himself and all the vampires away to a hidden temple. Sailor Uranus, Jupiter and Mars tell each other that they have to hurry before time runs out for them. Suddenly an evil voice laughs at them. Super Sailor Moon tells her to reveal herself and attacks the air. The voice, now Sailor Astarte encourages them and teleports them to the temple Dracul mentioned. When they get there they find all the vampires in different dress with Astarted in particular in very old clothes. It's then revealed that the personality possesing Astarte is really "Cain" from the bible and Dracul is "Abel". Apparently after Cain killed Abel he turned into a vampire. Cain, in Astarte's body who worships Death Vulcan's powers begins to kill off several of the vampires. Vampiru, Dracul's daughter, begins to cry and asks her father if this is what they all want, all the vampires to be killed. Sailor Mercury has had enough and steps forward determined to put an end to the fighting and violence. The power of Sailor Astarte breaks free for a bit from Cain and awakens Para Para, Ves Ves, Jun Jun and Cere Cere as Sailor Pallas, Sailor Vesta, Sailor Juno and Sailor Ceres and allows Chibi Usa to transform into Super Sailor Chibi Moon. As Cain kills another vampire, he transforms the powerful sword into another sword drawing from the Maiden of Orleans (Joan of Arc) and gives it to Super Sailor Moon before he dies. Dracul, moved by this takes the sword from Super Sailor Moon and together everyone attacks Cain. Super Sailor Moon powers up to Eternal Sailor Moon and together with everyone's help defeats Cain and destroys Astarte's body in the process. Dracul says that Cain will never disapear as long as he is alive. Vampiru adds that if Death Vulcan's orbit shifts he could bring disaster at any time. Eternal Sailor Moon then recounts the nightmare she had about impending doom. The story isn't over yet. "Do the Japanese Sailor Moon DVDs have English subtitles?" "Bootleg Sailor Moon DVDs versus Official Sailor Moon DVDs. What's the difference?"